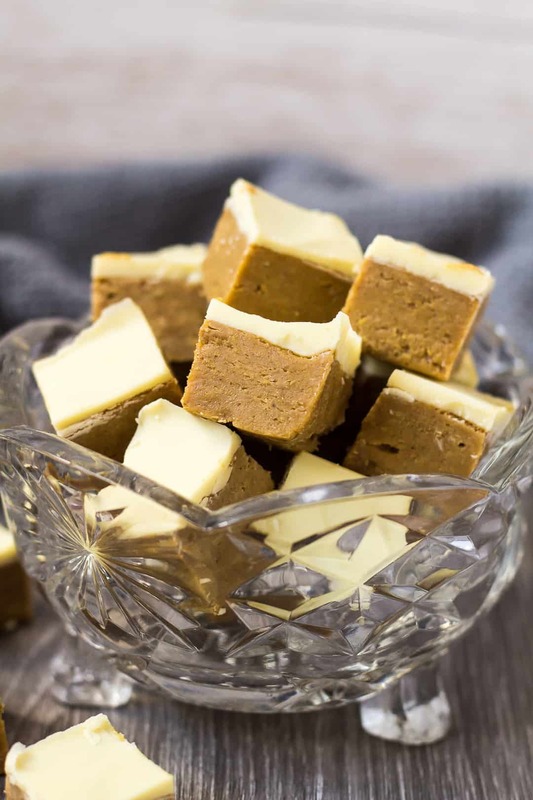 Gingerbread Fudge – Deliciously creamy gingerbread fudge that is made in the microwave, loaded with flavour, and finished off with a white chocolate topping! One of my all-time favourite flavours to enjoy around Christmas time is gingerbread. It’s such a warm, comforting flavour that goes with pretty much any dessert. Cake, cookies, candies, etc. They’re all gonna taste divine. 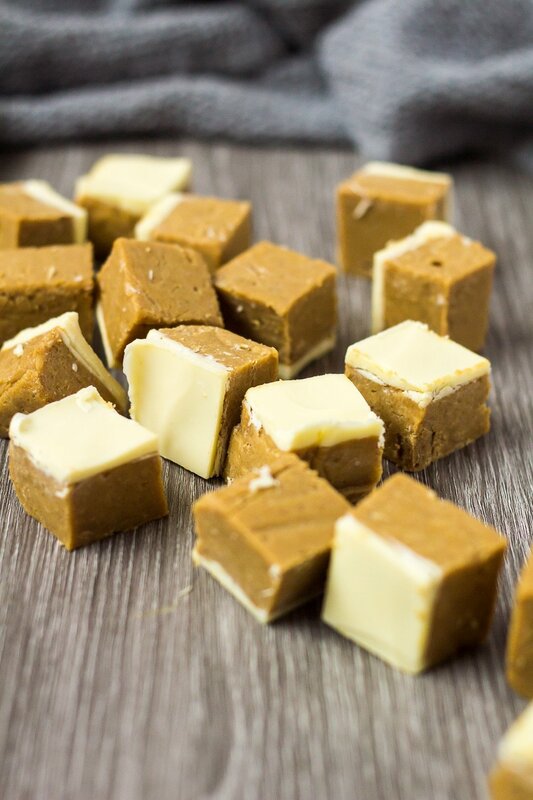 Today, I bring you my Gingerbread Fudge recipe. 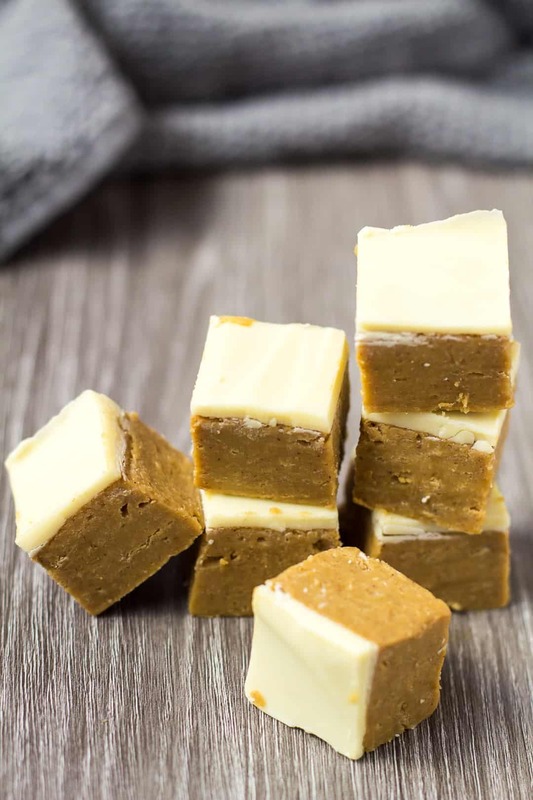 This fudge is super creamy, bursting with them warm flavours, topped with white chocolate, and is made in the microwave. So quick, easy, and delicious! White chocolate: 24oz total. High quality white chocolate that you enjoy eating on its own. Molasses/black treacle: Do not use blackstrap. 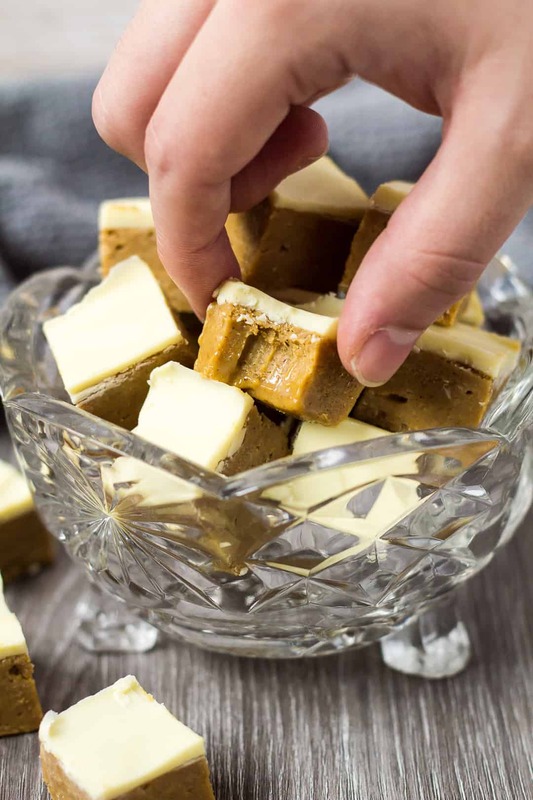 To make this fudge, simply place 18oz of white chocolate into a large microwave-safe bowl, and heat in 20 second intervals, stirring after each one, until melted and smooth. Mix in the molasses, vanilla, and spices. The mixture will become very thick at this point. Stir in the condensed milk until combined. Spread the mixture into an 8×8-inch square baking pan lined with foil or parchment paper, and smooth out the top. Refrigerate for 2 – 4 hours or overnight until completely set. Melt the remaining white chocolate in the microwave. Pour over the fudge, and spread out evenly. Allow the chocolate to set at room temperature or in the fridge before cutting into pieces. 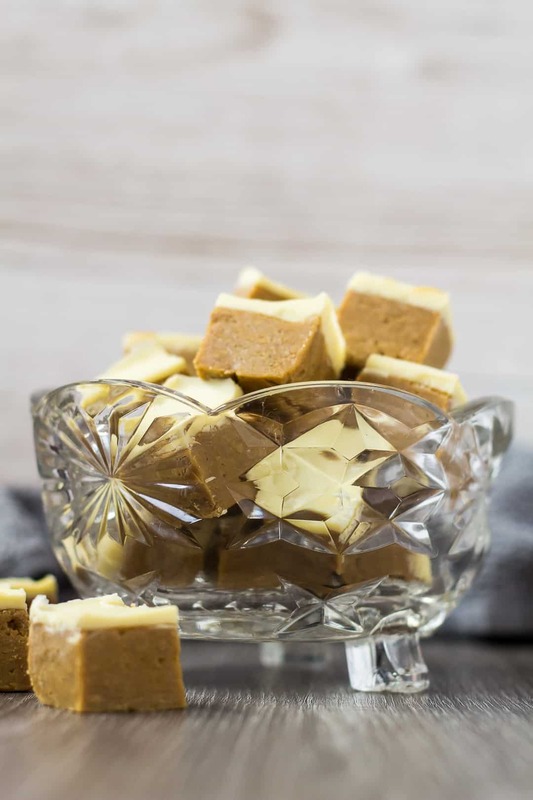 What molasses can I use in this fudge? I would recommend using light or true molasses, which is much sweeter, and lighter in flavour than blackstrap molasses. 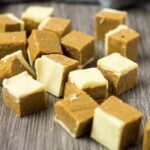 Blackstrap is too strong and bitter, and will overpower the other delicious flavours in this fudge recipe. If you’re in the UK, black treacle works just fine, too! How long will this gingerbread fudge last? 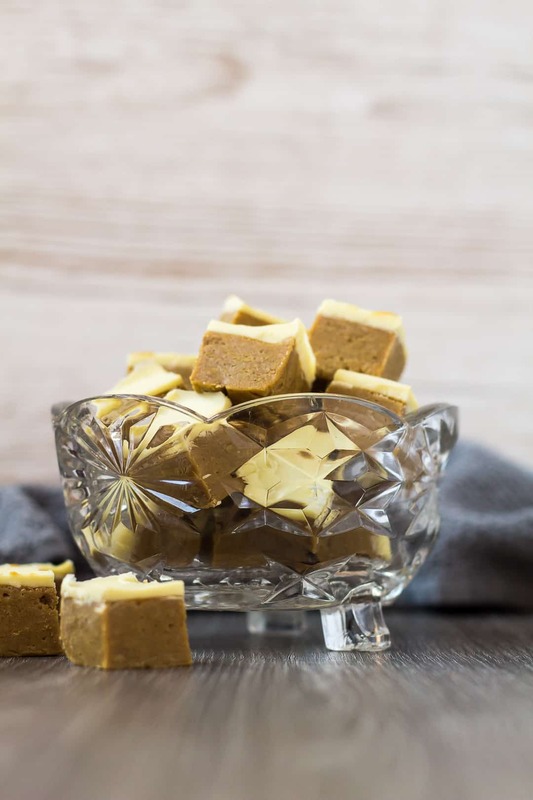 This fudge can be stored in an airtight container at room temperature for 1 week, or in the fridge for 2 – 3 weeks. Can I freeze this fudge? Yes, this fudge freezes well for up to 2 months. Thaw overnight in the fridge before serving. Try these Gingerbread recipes next! Mix in the molasses, vanilla, and spices. The mixture will become very thick. Stir in the condensed milk. Spread the mixture into the prepared pan, and smooth out the top. Refrigerate for 2 - 4 hours or overnight until completely set. Place the chocolate into a microwave-safe bowl, and heat in 20 second intervals, stirring after each one, until melted and smooth. Pour over the fudge, and spread out evenly. Allow the chocolate to set at room temperature or in the fridge before cutting into pieces. Fudge can be stored in an airtight container at room temperature for 1 week, or in the fridge for 2 - 3 weeks. It also freezes well for up to 2 months. Thaw overnight in the fridge before serving. I am obsessed with everything gingerbread lately! This looks so yummy! OMG this fudge is AMAZING! My new favorite! I especially love how easy it is to make with the microwave. I will definitely be making more and SOON. I am loving this fudge flavor!! !